Ozzy’s death hit me hard, and it was a while before I could even consider another dog. But living for the first time in 28 years without a canine companion was more than I could stand. The search began. I knew I wanted a rescue. I was leaning toward a hiking companion. 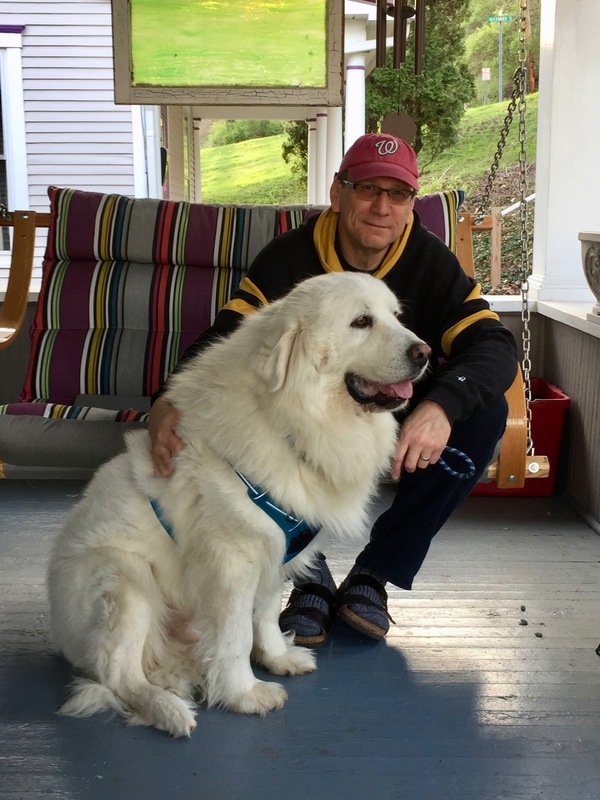 But other than that, I was open-minded as I perused the dogs at the Friends of Shelter Dogs site as well as the Athens County Dog Shelter’s Facebook page. 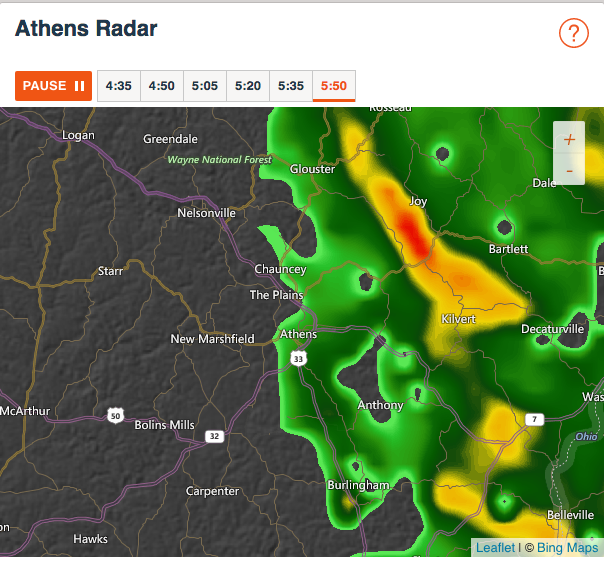 From there, I drifted on to Petfinder, narrowing my search to a 10-mile radius around Athens. That’s when Sunshine broke through the clouds. 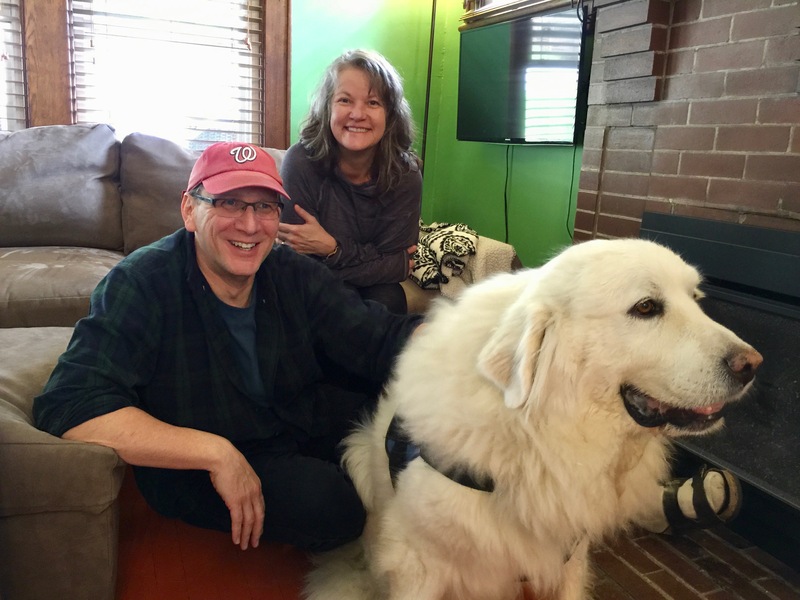 She wasn’t what I had in mind, a senior great Pyrenees who had led a tough life and found an angel named Cindy at the National Pyr Rescue to foster her. I didn’t reach out, still reeling from Ozzy’s death and worried about the commitment of a new, geriatric dog. But I kept returning to Petfinder like a Facebook creeper until a notice popped up saying her adoption was pending. I started to move on, still creeping but comforted by the fact that she’d found a home. Then I saw the ad again, and the “pending” notification had disappeared. I sent an adoption application to the rescue organization. The rest, as they say, is history. We now have an amazing, massive presence in our home. Like Xena, my late, great Newfie, Sunshine is very conscious of her size. She knows how to use it to her advantage, and she’s graceful for a big creature, sorta like an offensive lineman. A beast comfortable in her own skin. I had forgotten how hard a large dog, even an old one with hip pain, can pull when she decides to set course for something fascinating. We’ve been working on that, and hooking her leash to the chest ring on her harness instead of the back made it much easier to steer her. And she’s so eager to please that it’s pretty easy to use praise to get her moving in the right direction. Lara, Sunshine and me during one of Sunshine’s visits to our house before the adoption. It was love at first sight. She’s anxious, but not obsessively so. Traffic and sirens still cause concern for this dog who lived most of her life tethered on a short chain out in the wilds of Southeast Ohio. Her progress since she was rescued has been nothing short of amazing, thanks in large part to the work her foster did with her before we adopted her. That work continues, and we’re making great strides. Sydney tries to let Sunshine know he’s bigger and badder than he looks. 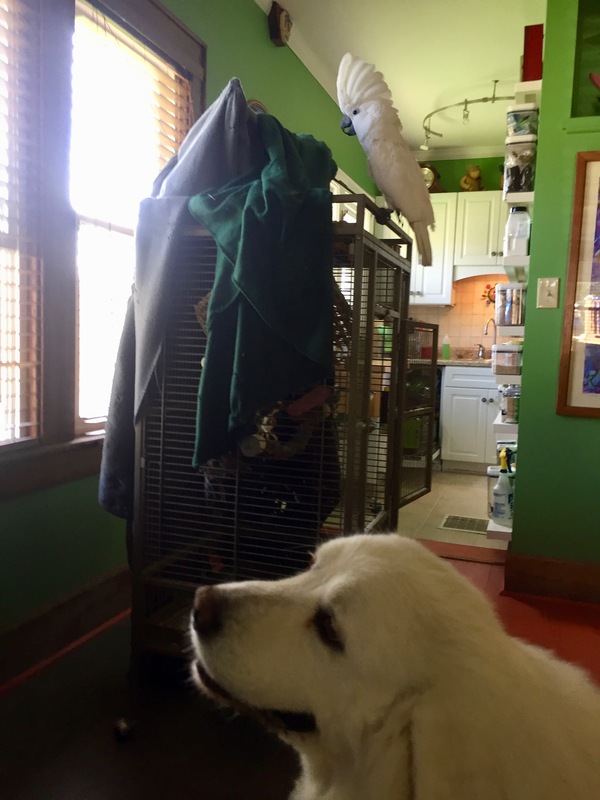 The major challenge now is getting Sydney, our deranged umbrella cockatoo, to come to grips with the fact that he has another canine to contend with. The jealousy is palpable. At least from the cockatoo. 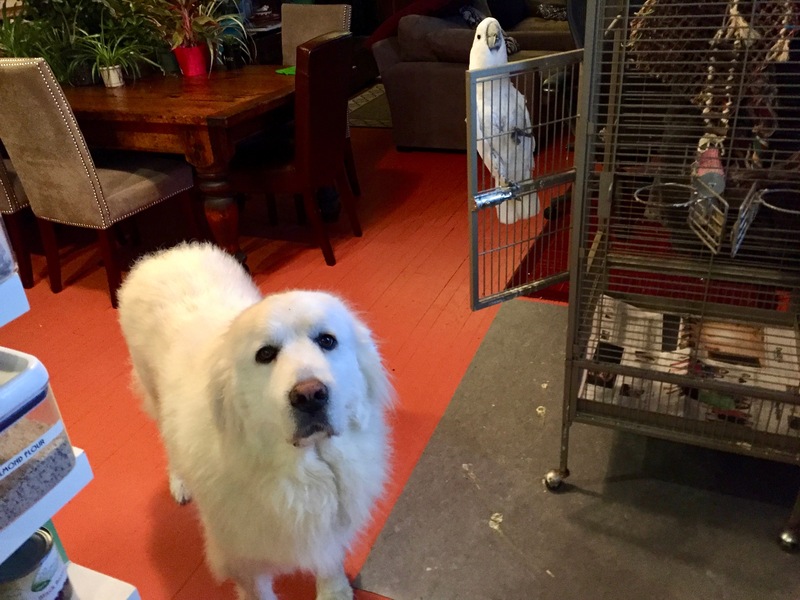 The mighty Pyr largely ignores him, preferring to focus on the morsels strewn around his cage. This gets really ugly if Lara forgets and pets Sunshine before Sydney or pays too much attention to the dog. While Sydney will tolerate me whoring around with a canine, Lara must remain faithful to our avian overlord to ensure peace in the kingdom. There have been hissy fits and temper tantrums, but things are settling down. Sydney is slowly adjusting to the new dog in the house. 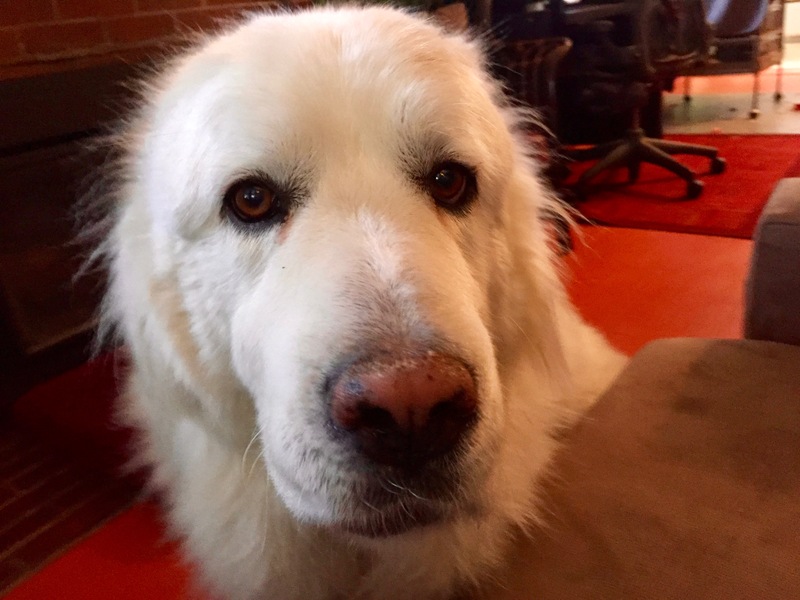 It’s wonderful having a giant breed dog lumbering around the house again, and Sunshine’s estimated age of 7-10 might be closer to 7 based on her behavior thus far. She’s in good shape, with the hip problems I’d expect to see in a geriatric giant breed dog. 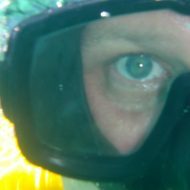 Fortunately, I have a lot of experience here after raising Xena from a pup. On the night Sunshine came to live with us, I flicked on an overhead light near Sydney to beat back the gloom of a spring rainstorm and ran downstairs to see how our new gutters were performing. All good. Then I returned to the front porch to read The New York Times and write about Sunshine. Suddenly, the skies clear. 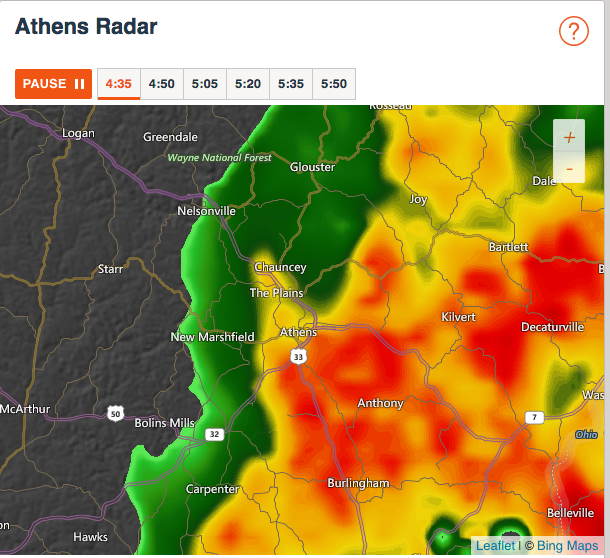 Here comes Sunshine!